The Welsh Pony and Cob Society was founded in Wales in 1901 and their first studbook was published in 1902. The original classification for Welsh ponies was Section A, the Welsh Mountain Pony. With a great need for children’s riding ponies Section B, the Welsh Pony, was added in 1931. With Section A ponies as its foundation, the breed standard for Section B is the same as for Section A but more particularly the Section B pony was described as a riding pony, with quality, riding action, adequate bone and substance, hardiness and constitution and with pony character. In the period around 8000BCE Britain was physically attached to both Ireland and Europe and there was free migration of animals and peoples from eastern Europe. Studies of migration and DNA tracking during the Stone Age through the Bronze Age revealed that the Celtic people and their animals took this East-to-West route and established themselves in Wales, Ireland and the Hebrides (Shetland). Most probably they brought with them the small foundation horse breeds like the Caspian and interbred them with the native Exmoor pony (which goes back 6,000 years on the British Island) to produce a slightly larger (13h) yet lighter riding and chariot horse. The large Bronze Age collection of fragments of harness and small (less than 3") bits found in North Wales indicates that ponies or pony-sized horses were being used for harness work at that time. Certainly ponies were very much in evidence in Wales during the conquest of Julius Caesar (55-54BCE) who wrote about their speed and docility as chariot horses and their activity as riding horses. 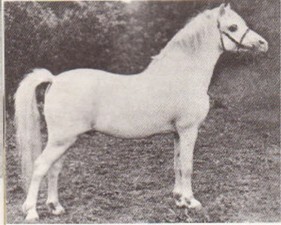 Modern research has shown the the Caspian horse (a pony sized equine standing about 13h) brought the infusion of "eastern blood" in the early beginnings of the Welsh pony breed. The Caspian horse was also the foundation for the Arabian horse, and the "Arab-like" appearance of the Caspian has been in place since the Roman occupation. The Caspian was predominantly blacks, browns and dark duns. Caspian horses accompanied the Romans into Britain and many remained behind when the Romans withdrew in 410 AD. The next mention of Welsh Ponies is in 1188A.D. when the Welsh Hills were reported to be "full of ponies". The old theory was that much of the final type of the Welsh Pony and Cob was established at this stage through the influence of Barb and Arab stallions brought back from the East by the Crusaders, but there was no firm evidence to confirm this. Modern research into the migration patterns of the world civilizations is more factual. The coming of the Norse (Normans) and Saxons, who were accompanied by their more cold blooded ponies (Icelandic and Flanders draft horses), diluted the hot blood in many Welsh ponies, were the basis for the development of the Welsh Cob. The cob earned a better debt to England's King Henry VIII in 1535 when he ordered the destruction of all horses under 13hh because they were too small to carry the weight of a knight in full armour and were eating valuable grazing. Fortunately the inaccessibility of the mountainous areas of Wales prevented this death sentence from being carried out in that areas that harbored the small mountain ponies and left them untouched by the heavy infusion of French draft blood being bred into their cob cousins to make them bigger and stronger. The death law was later repealed by Queen Elizabeth I. When staying at Rug (a Welsh town near Corwen) as a boy about 1850, I noticed two distinct types of Welsh Ponies around the 13 hands in height, the one "old" type, thick set, well made carrying the shooting parties with wonderful ease and safety. The other type showed the influence of Apricot [of Barb/Arab descent], lighter with more quality, they make excellent children's ponies; the mares of this sort are exactly the ones to mate with either Thoroughbred or Arab stallions for breeding Polo Ponies." By 1892 between 1,000 and 1,500 ponies were counted on the Longmynd Hills and this number can probably be multiplied by 10 to account for the ponies in the Brecon Beacons, the Denbeigh beacons, Eppynt and Carmarthen. The growing need for small riding ponies and carriage ponies for the children and ladies of the gentry led to a combined effort in the 1880s to bring the Welsh mountain ponies into the limelight, and that was achieved through Dyoll Starlight who was one of the foundation sires of the modern Welsh Mountain Pony. Starlight's lineage goes back to an Arabian horse, called the Crawshay Baily Arab, who was turned out on the Brecon Hills in 1850. 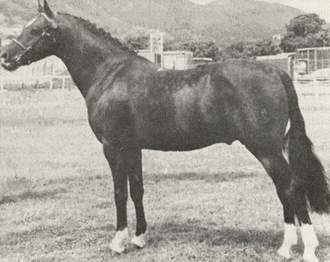 This stallion is believed by many to be the ancestor of Dyoll Moonlight, the dam of Starlight. In particular a grey Arabian stallion owned by Mr. Williams of Aberpergwm was a strong influence and whose blood is believe to also be part of Moonlight's lineage, as well as being credited with introducing the grey gene into the hill ponies. However, it was the Wentworth prefix in the Welsh pony lines that draws the most comment on the infusion of Arabian blood. Lady Wentworth who bred the Crabbet Arabians is also strong in the introducton of the Arabian horse into the Welsh Pony bloodlines. Lady Wentworth was renown for cross breeding her Arabians, most notably the Polish Arabian stallion Skowronek, with her Welsh pony mares as she considered the Welsh/Arab combination to create "the most beautiful pony in the world." From the Crabbet Catalog in 1922: Champion SKOWRONEK, a White Kehilan Ajuz of the strain imported to Poland by the Antoniny Stud. G.S.B. Vol 24. P.P.S.B 664. Hurlingham 12003, and R.S.B. Sire Ibrahim (white) by Heijer ex Lafitte. Dam Yaskoulka, 99 vii, R.S.B., a Kehilet Ajuz by Rymnik ex Epopea by Dervish ex Lyra, 198 R.S.B. Count Joseph Potocki's famous Arab Stud at Antoniny dated from before the year 1700. It was destroyed by the Bolsheviks during the Great War, 1916." "This horse is the ideal type which Abbas Pasha I., of Egypt, spent a fortune in collecting from the desert where it is now unprocurable. No more perfect specimen has ever been imported to England. The pure white colour is very rare and greatly valued. Lady Anne Blunt spent the last twenty years of her life in a vain search for a horse of Skowronek's type." Skowronek ("Skylark"), was foaled in 1909. Bred by Count Potocki at Antoniny Stud in Poland, his sire Ibrahim was imported to Poland from Constantinople, Turkey in 1907 as an 'Original Arab'. His dam Jaskolka (Yaskoulka) ("Swallow") was of established Polish bloodlines. 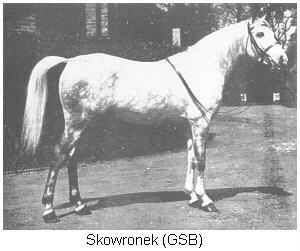 Skowronek was a beautiful homozygous grey, snow white in his maturity. He was imported into England in 1913 by Walter Winans, was sold to Mr. Webb-Ware, and then to Mr H. V. Musgrave Clark, from whom Lady Wentworth subsequently acquired him. He was small, about 14 hands, but beautifully proportioned and of a sweet character. His get in the Welsh pony world is extensive, and he was very instrumental in bringing many of the best Arabian horse conformation into the Welsh bloodlines. His influence in the Arabian horse comes through his famous son, Raffles. 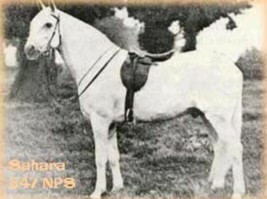 By far the most influence of the Arabian blood can be seen in the TAN-Y-BWLCH ponies which were bred from Arabian horses crossed with the Welsh Mountain Pony in the 1930's. 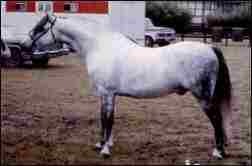 Foundation sires TAN-Y-BWLCH PENWYN and TAN-Y-BWLCH BERWYN were both half-Arabinn, both sired by Arabian stallions. 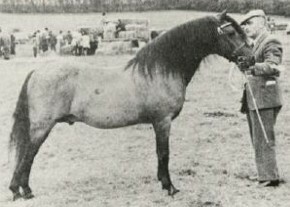 This heavy Arabian influence in the TAN-Y-BWLCH Welsh ponies also influenced the Coed Coch lines which were founded on TAN-Y-BWLCH bloodstock which accounts for the strong Arab features and gray coloring in this lineage. 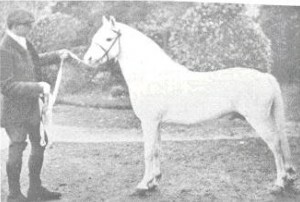 Two other breeds had much influence during this period: the Thoroughbred - via the small thoroughbred stallion "Merlin" who was turned out with a Welsh herd on the Ruabon Hills by his owner, Sir William Watkins Wynn - and also the Hackney Horse which figures prominently in the lineage of the Welsh Cob. From 1884 it had been possible to record the parentage of Welsh Breeds in the Hackney Stud Book and from 1899 in the Polo Pony Stud Book as well. In 1901 the Welsh Pony and Cob Society was founded with 248 members under the presidency of Lord Tredegar. Vol. 1 of the Stud Book was published in 1902 and contained records of 38 stallions and 571 mares. It should be noted that there has been a Section B of the Stud Book right from the beginning. Farmers had developed a shepherding pony which could also be used for cattle herding, rounding up wild mountain ponies, riding to stock fairs and taking part in pony races. This Section B was originally developed by crossing Mountain Pony mares with small, quality Cob stallions and was more along the lines of what we know today as Section C and D.
In 1908 the Commons Act was passed which restricted the turning out onto Common Land of entire animals. Only approved stallions, whose owners were paid a premium, could be turned out with the mares and they soon started producing "uniform mobs of typically fixed animals" (Wynne Davies). In 1911 it was decided to ban Hackneys from registration into the Cob Sections of the Welsh Stud Book as there had been several incidences of pure Hackneys competing and winning at the National Welsh Pony Shows. In 1918 the Horse breeding Act was passed in which every breeding stallion had to be licensed annually after a veterinary inspection. 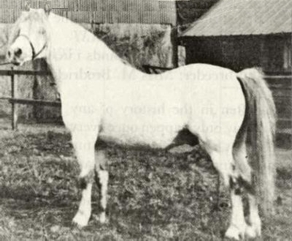 By the late 1920's a tremendous demand for quality children's ponies encourage the Welsh Pony Society to allow two stallions of eastern blood (at least 1/2 or more Arabian) into the Stud Book. These were Tan-y-Bwlch Berwyn (by the Barb stallion Sahara) and Craven Cyrus (by King Cyrus a full Arab son of the polish Arab Skowronek). Many of the resultant larger mares were crossed either with Hackneys for harness ponies, or thoroughbreds and Arabs to produce the famous partbred ponies which are so popular today. However, it must also be noted that these stallions figure largely in the ancestry of several influential Sec. A and Sec. B sires and dams. In 1930 the Stud Book was restricted to registered animals, and in 1931 the maximum height limit for Sec. A's was fixed at 12hh because experience had proved that ponies of this height or less were best able to survive in the hills. Because the 1930's Depression and the 2nd World War resulted in very few purebred animals being registered, the Foundation Stock scheme was introduced. This scheme allowed unregistered mares to be accepted after inspection. Their female progeny by Registered stallions were accepted as FS1; the foals of those progeny mated to a Registered stallion became FS2. Any foals of FS2 pony mares mated to a registered Stallion were accepted as registerable stock. The present day classification of Secs A, B, C & D was voted upon and accepted in 1949. The Welsh Partbred Register was approved in 1950; the same year the Sec. A of the Stud Book was closed. By 1960 there was enough breeding stock available to close the Stud Book to any further FS registrations. In 1990 only 7 FS2 fillies were registered. DYOLL STARLIGHT (foaled 16th May 1894/died 1929 11.2 1/2h), was bred by Mr H Meuric Lloyd (Dyoll is Lloyd read backwards) from his part-bred Arabian pony mare. Mr. Lloyd's family the Lloyds of Danyrallt and Cynghordy, was among one of the oldest Welsh families in Wales, and his stud farm with DYOLL STARLIGHT as his foundation sire, began a dynasty of siring beautiful ponies. Amongst his sons and daughters were the very Arab-looking GREYLIGHT (exported to Australia), BWLCH QUICKSILVER (owned by Mrs. Pennell), BLEDDFA SHOOTING STAR, GROVE KING COLE, GROVE STAR OF HOPE, LADY STARLIGHT etc. DYOLL STARLIGHT had a magnificent show ring record, winning first prizes each year at the Royal Show from 1898 to 1901. When he was retired in 1912 (aged 18) he was placed at the Royal Welsh Show and awarded a silver medal. Mr Lloyd’s health began to fail in 1919 (he died in 1922) and STARLIGHT went to spend the rest of his days with Lady Wentworth at the Crabbet Park Arab Stud, where he sired the noted WENTWORTH SPRINGLIGHT amongst others of note. It was a condition of sale that STARLIGHT should not be sold from Crabbet but it is thought that he was sold with mares to Spain about 1925, and died there at the age of 35 years. Another stallion to have had a tremendous influence on the Welsh Mountain Pony was COED COCH GLYNDWR (foaled 1935/died 1959 - gray 11.1h), who had two strains of DYOLL STARLIGHT on his dam’s side. Through both his sire REVOLT (f. 1909) and his dam DINARTH HENOL (f. 1927), GLYNDWR traced back to his grandsire LLWYN TYRANT ( f. 1905) g-grandsire PRINCE OF CARDIFF (1895) to the Hackney Stallion HAMLET PRINCE OF DENMARK (1892) H-4804 who traces back through 5 generations to TAYLOR'S PERFORMER (1840) H550 whose pedigree goes back 10 generations to the famous DARLEY'S ARABIAN (1700) through his racehorse son BARTLETT'S CHILDERS (1715). CRAVEN CYRUS (foaled in 1927) by KING CYRUS (Arab by Lady Wentworth's Polish Arabian Stallion SKOWRONEK) out of IRFON LADY TWILIGHT (foaled 1913) by DYOLL STARLIGHT. This pony was more than 3/4 Arabian and was the most influential through DOWNLAND LOVE IN THE MIST (STAR SUPREME x CRAVEN SPRIGHTLY TWILIGHT) whose sire STAR SUPREME being a son of LADY CYRUS (foaled 1941) daughter of CRAVEN CYRUS. STAR SUPREME and LADY CYRUS were bred by Mr A.L. Williams of Blanetwrch where CRAVEN CYRUS spend his last days. 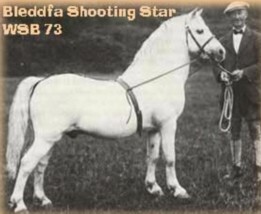 TANYBWLCH BERWYN (foaled in 1924) by SAHARA (an Arabian Barb) out of BRYNHIR BLACK STAR by BLEDDFA SHOOTING STAR. BERWYN is represented via his sons and daughters COED COCH BERWYNFA, COED COCH ERLEWYN sire of TANFFYNNON TWM SHANCO (a noted sire in Mid-Wales), COED COCH SIABOD a Royal Welsh Section B Champion before being exported, TANYBWLCH PENLLYN grand-dam of CLAM PIP, BRYN GWYN grand-dam of TREHARNE TOMBOY etc. CRIBAN VICTOR (foaled 1944) provided a useful outcross, he was sired by CRIBAN WINSTON and gained his height from his dam CRIBAN WHALEBONE who was of Cob parentage with both Hackney and Thoroughbred blood. CRIBAN VICTOR spent most of his active life at the Gredington Stud and left a great mark on Section B ponies throughout the Stud Book. TAN Y BWICH BERWYN (1924-1953 Sahara X Brynhir Black Star) often called the "Father of the Section B" as almost all B ponies trace back to him. The Welsh Pony of the 21st century has found a permanent place in the show world of the hunter pony and in driving and foxhunting. In the show world vast amounts of money were being spent for the perfect hunter pony that could do 8 perfect fences, and win in the Models classes. Shows now offered pony classes for smalls (up to 12.2), mediums (12.3 to 13.2) and larges (up to 14.2). Welsh Section A's were of abundant supply; however, there were only 26 registered Welsh Ponies (B) in 1959 and many of these were small mediums. For the large pony hunter field one found many Welsh Section A/Thoroughbreds crosses who were being bred to fill this market nitch. 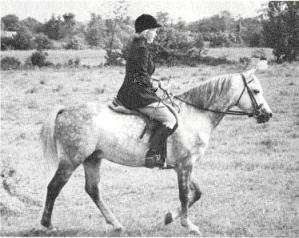 In the 1970's a more updated and larger version of the Section B was to take shape with ponies of a more Thoroughbred-breed type . 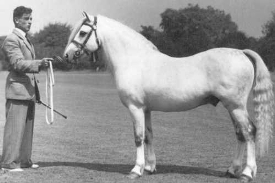 A taller yet still typy Welsh pony which was wanted for the large classes was an idea not lost upon three main breeders who decided to change their breeding strategy to fill this need. The first breeder to redirect her program towards a taller Section B Welsh pony was Nancy Benitz of the Findeln Stud (Canada). When her two children outgrew their beloved small Welsh Mountain Pony, she and a friend and fellow breeder, Mr. Howard Black, decided he should go to England to find a suitable stallion to be used as the basis for their new direction in breeding. There he found the 13.2h gray stallion *BROCKWELL SPIDER (by Harford Starlight out of the bay Section B mare Fayre Ladybird), and promotly imported the stallion back to Findeln Stud. Brockwell Spider showed the heavy influence of Arabian blood through his Wentworth pedigree with many crosses back to Bleddfa Shooting Star only two generations removed, but he also brought in the height desired for the taller Section B, and bay/chestnut color from his dam's side. FINDELYN CINNABAR (by Findeln Blue Danube out of Findeln Ruby - a chestnut daughter of *BROCKWELL SPIDER) was the senior herd sire at Findeln in the early 1990's. The Findeln bloodlines are found in the majority of top winning Welsh hunter ponies today. Two other stud farms were also involved in achieving a more modern Section B -- Farnley Farm in Virginia, and GlanNant in New York, through their respective foundation sires: *DOWNLAND DRUMMER BOY, a bay who doubles back to the 12h chestnut DOWNLAND SERCHOG (of Criban ancestory), and *CUSOP SHERIFF whose generational bloodlines are close in to SAHARA(Arab Barb stallion) and several trotting cob lines. It was said of DOWNLAND DRUMMER BOY that he was both patient and kind, and that he passed on his gentle temprament to all his get. Drummer Boy was the maternal half-brother to DOWNLAND DAULPHIN who had had a great deal of influence on the modern Section Bs, particularly through his son DOWNLAND CHEVALIER who grew over height at 13.3h and therefore was never shown. DOWNLAND DRUMMER BOY appears in almost every Farnley pony pedigree, and most probably accounts for the huge numbers of Farnley ponies that are winning in the hunter show ring today. He was also another one who was instrumental in the resurgence of the chestnut and bay colored Section B Welsh pony. *CUSOP SHERIFF (B-11466) was used by the GlanNant, Shenandoah, and Findeln Stud through the 1960's and 1970's siring some of the top Welsh Section B ponies today. 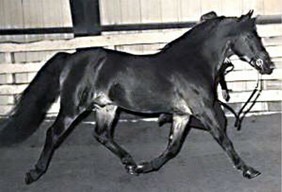 His breedings with Findeln Cricket (a black daughter of *Brockwell Spider) and Shenandoah Moonstep produced outstanding breeding stock for show ponies in the hunter ring. These three famous Section B sires, and the three stud farms that inter-bred their stock to each other's, could fully be credited for the phenominal rise and success of the Section B today. 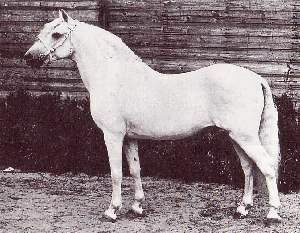 The heavy infusion of Arabian blood in 1900-1920 did much to render the formerly bay and chestnut Welsh pony of any color except gray. 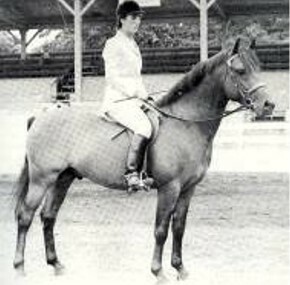 Now and then a darker color would surface, but little was done to foster back the chestnut and bay colors until the 1980's when a darker colored pony was found to be more desireable for the hunter show ring. The bay/roan stallion CRIBAN VICTOR, the bay DOWNLAND DAUPHIN, his chestnut son DOWLAND CHEVALIER, the bay DOWNLAND DRUMMER BOY, and the brown/bay COED COCH BALLOG, as well as several other popular dark Welsh stallions of BROCKWELL COBWEB breeding that were being extensively used by the Welsh pony hunter-type breeders, were instrumental in returning some color to the Welsh ranks. A great many of these color lines trace back to the early days when the black/bay/chestnut Thoroughbreds and Hackneys figured strongly in the foundation lineage. Section C & D are overwhelming of bay and brown coloring due to their extremely strong infusion of dark colored Hackney and draft blood. It was only a matter of time, however, before the gray Arabian coat color gave way to the more traditional colors of bay, black, and chestnut in the coats of the modern Section B Welsh Pony. The Section A still shows a strong preference for their ancestral gray Arabian coloring, but more and more bays and chestnuts are now being seen, emphasizing the never-ending variety of genetics that went into the physical make-up of the Welsh pony breed.